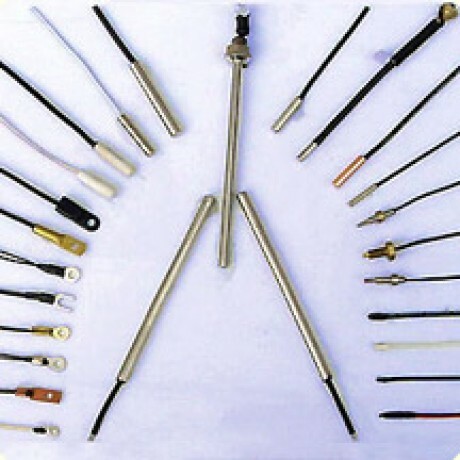 CWF Precision NTC Thermistor Probes for Temperature Measurement. The CWF series NTC Thermistors are supplied in 5 basic styles of enclosures designed to facilitate installation in a wide variety of applications. PVC leads are applied to a precision, high-reliability NTC thermistor, insulated with heat conductive water resistant materials and potted into any of a wide variety of probe bodies. CWF thermistors are also available with custom housings or custom lead lengths for remote sensing and temperature control in difficult conditions. Also see the Cantherm Thermistor Probe section for additional models. • Wide variety of installation fixtures and probes are available to suit your needs. • Double layer packaging provides excellent insulation and high strength and impact resistance. Characteristics: Moisture resistant, good insulation, high reliability, small time constant, quick responses. Applications: Household air-conditioning, refrigeration and many others. Characteristics: High resistance to thermal shock, moisture resistant, strong and secure structure, high dissipation coefficient, the test current can be higher than that of the ethoxyline resin-package. Applications: Refrigeration, air-conditioning, water heaters, drinking fountains, and more. Characteristics: Good dimensional tolerances, good heat resistance and moisture protection, high voltage resistance. Applications: Air-conditioning, refrigeration, and more. Characteristics: Wide variety of fixtures, suitable for most applications. Applications: Fan control, industrial temperature controllers, and more. Characteristics: Small time constant, fast response, flexible and secure. Applications: Water heaters, electronic thermometers, and more. * Also refer to the Cantherm Custom NTC Thermistor Probes. (mW/ƒC) Themal time Constant (S) Operating Temp.